Kick arse!!!! Can't wait to see it. 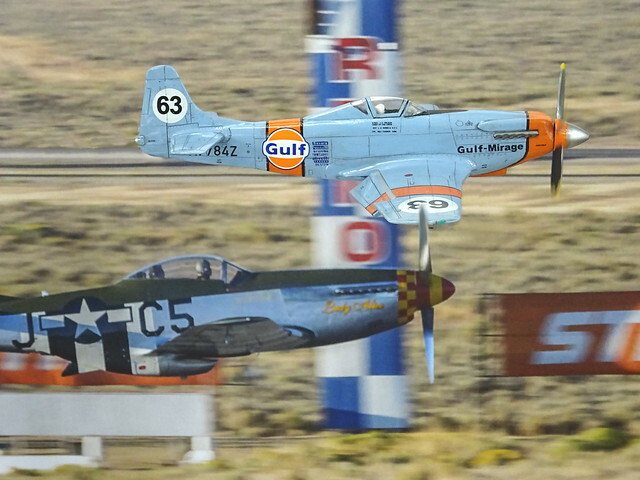 The Reno Air Races, officially known as the National Championship Air Races, is a multi-day event tailored to the aviation community that takes place each September at the Reno Stead Airport a few miles north of Reno, Nevada. 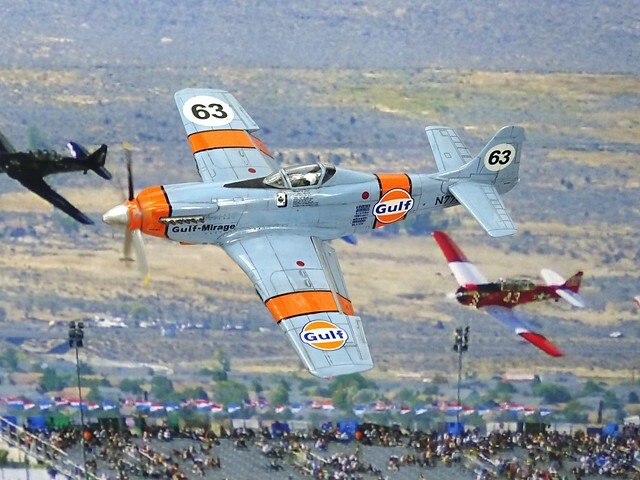 Air racing is billed as "the world's fastest motor sport" and Reno is one of the few remaining venues. 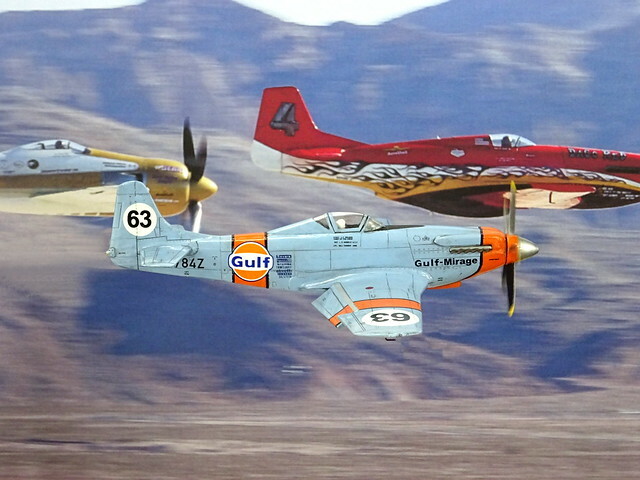 The event includes races in 6 classes and demonstrations by airshow pilots. The probably most spectacular race class is the "Unlimited". 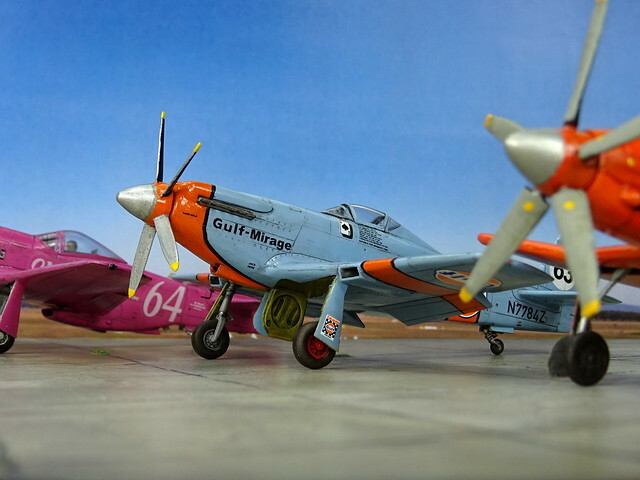 With the exception of very few “scratch-built” aircraft, the Unlimited Class has generally been populated by stock or modified WWII fighters with the P-51 Mustangs, F-8F Bearcats and Hawker Sea Fury being flown most often, flying in speeds exceeding 500 mph. 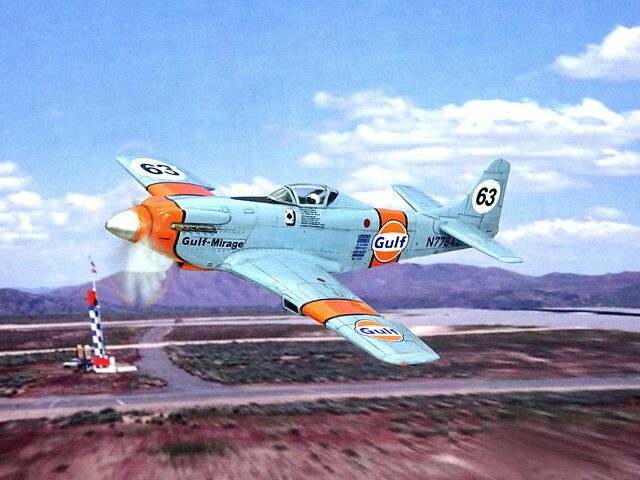 One of the many P-51 custom racers was the "Gulf Mirage". 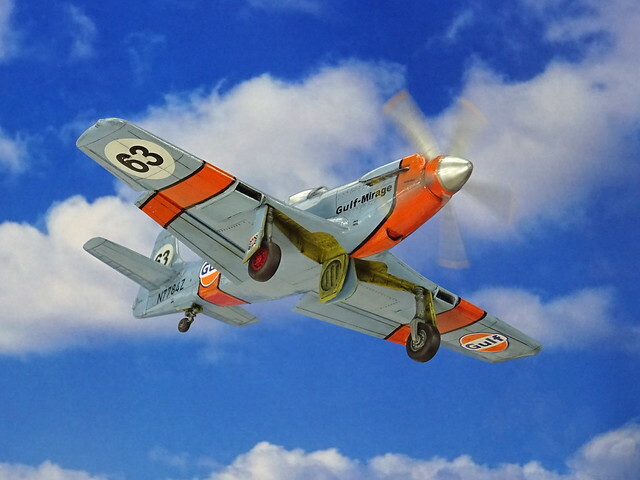 It was a former military aircraft (ex s/n 44-73350), formerly operated by the Swiss Air Force and bought for around $3,500, that had undergone several successive modifications during its career in order to reduce the aircraft's drag and make it more and more competitive. 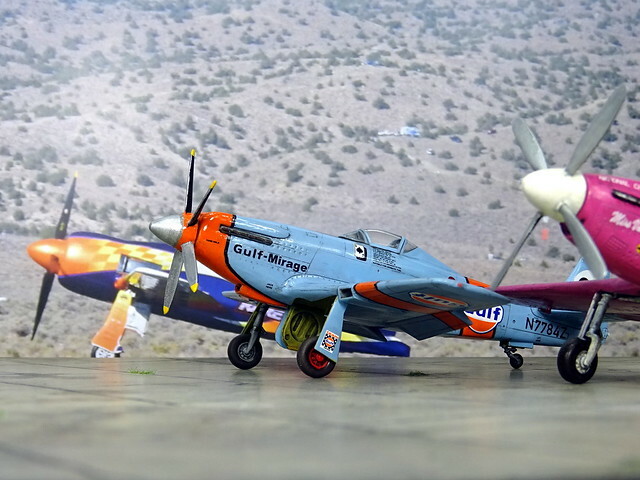 "Gulf Mirage" started its racing career in 1968 as an almost original P-51D which had been stripped off of any military equipment, under the ownership of Daniel Haskin, owner of Aeropart Service Inc. and WWII and Korea War pilot veteran. 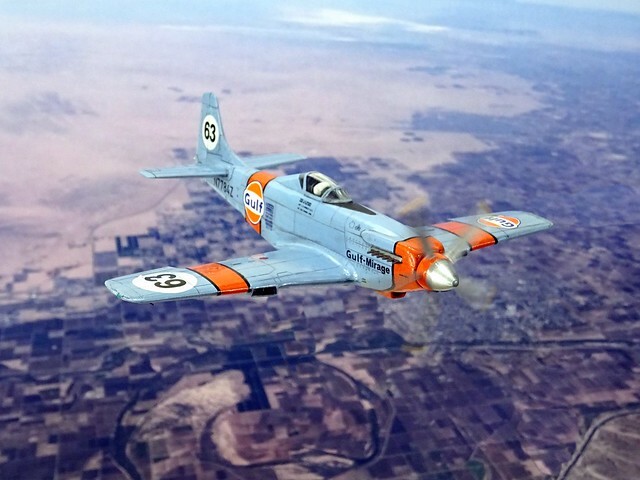 The aircraft's original name was "Mirage", with the civil registration N613C. The debut with the racing number 83 saw only a mediocre result, and, for the next season, the yellow and purple Mustang underwent its first major modifications. 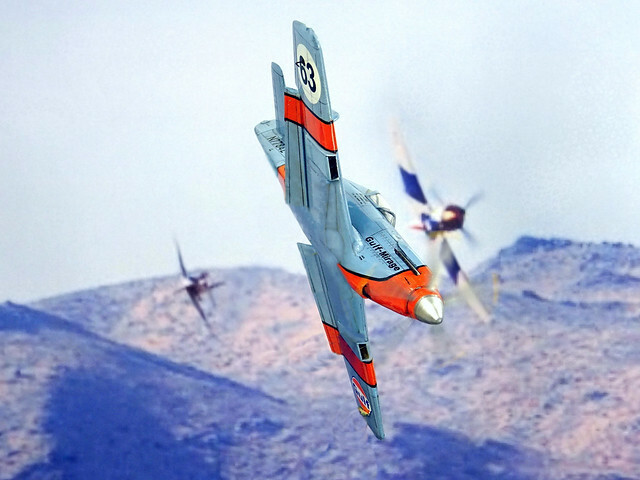 These were carried out by Aero Trans Corp. DBA in Ocala, Florida, and included clipped wings and ailerons (the wing span was reduced by a total of ~5'), and the Mustang's characteristic tunnel radiator was replaced by two recessed radiators, which now occupied the former machine gun compartments in the wings. 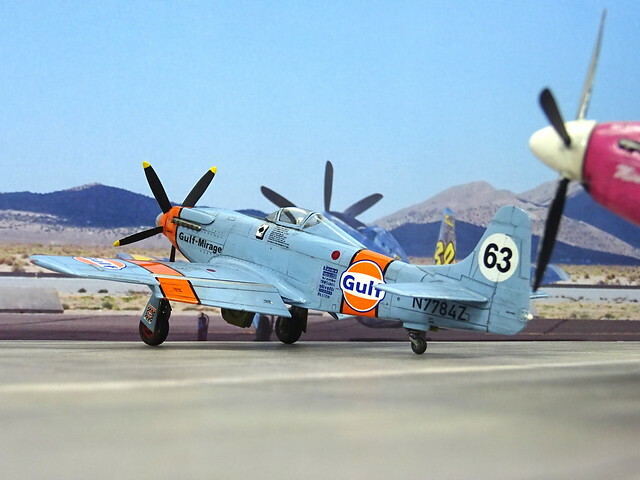 In this guide, the aircraft took part in the 1969 National Air Races, but severe cooling problems and numerous leaks in the almost untested radiator system prevented an active participation in the Unlimited Class races. 1970, "Mirage" was back, now tested and most technical bugs sorted out, and was able to achieve a respectable 4th place. 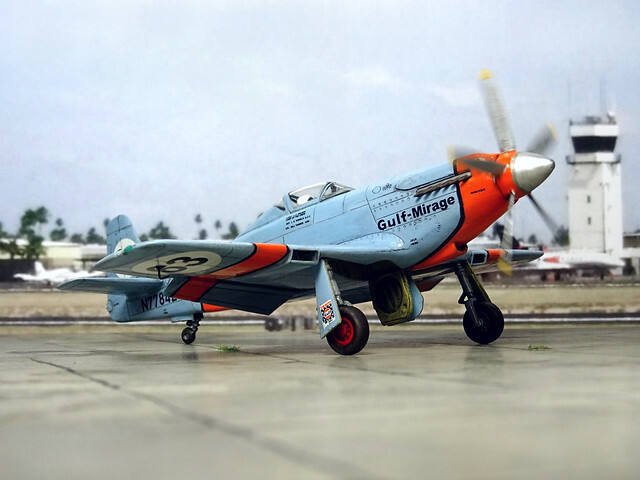 In 1971, the modified Mustang was back, but during the main race a piston jammed and the aircraft could hardly be controlled - ending in a rugged belly landing after the landing gear had collapsed upon touchdown, which also caused a crack in the motor block. 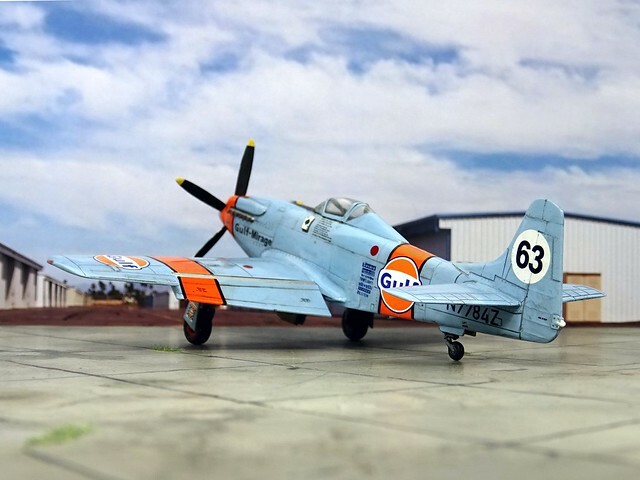 However, the airframe was mostly intact, and Daniel Haskin started to search for sponsors for a rebuild and upgrade of "Mirage", as well as a new pilot. 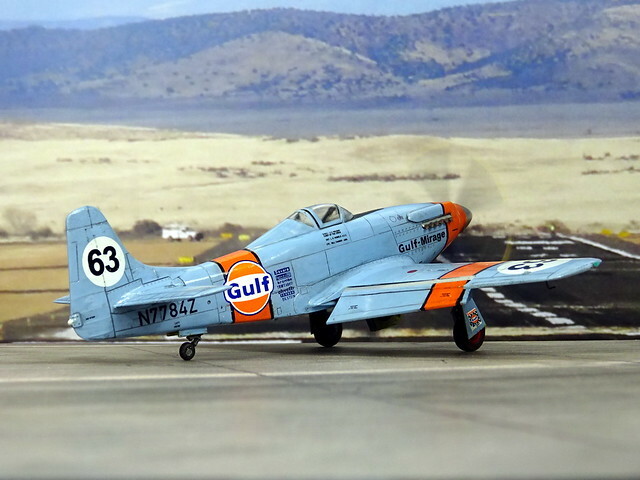 Through his industrial connections, he was able to win Grady Davis, vice president of Gulf Oil, who was an avid motorsport enthusiast and had founded the Gulf Oil Racing Team in 1966, for his project. In the course of 1972, "Mirage" underwent, thanks to financial and technical support, its second radical modification: the ruined Merlin engine was replaced by a bigger Rolls Royce Griffon (salvaged from an ex RAF Supermarine Spitfire PR Mk 19 reconnaissance aircraft) and its respective engine mounts, now driving a five blade propeller. 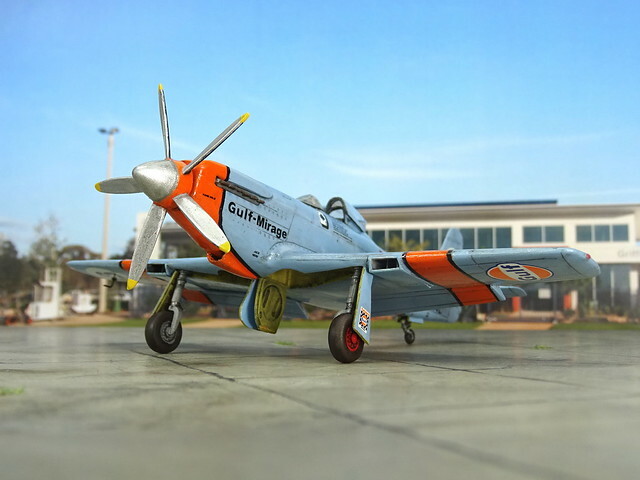 The wing radiators were slightly enlarged in order to match the Griffon's increased power, and the aircraft was rebuilt with an eye to weight reduction. In the end, 600 pounds (270 kg) were removed from the airframe. 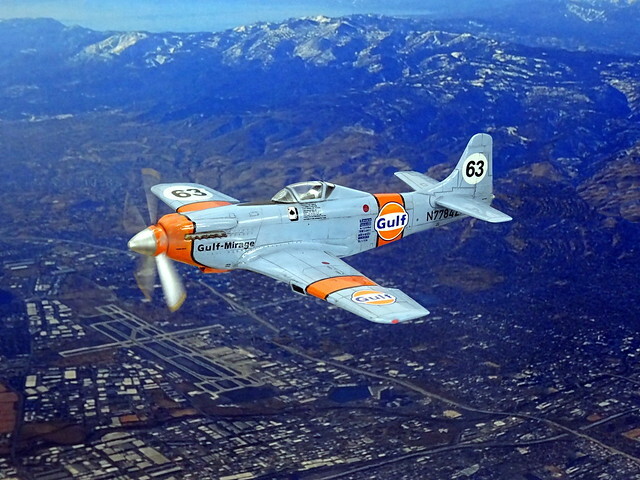 The Mustang's original bubble canopy was replaced by a much smaller, streamlined fairing, and, after initial flight tests, the fin was slightly extended in order to counter the new propeller's torque and improve directional stability. 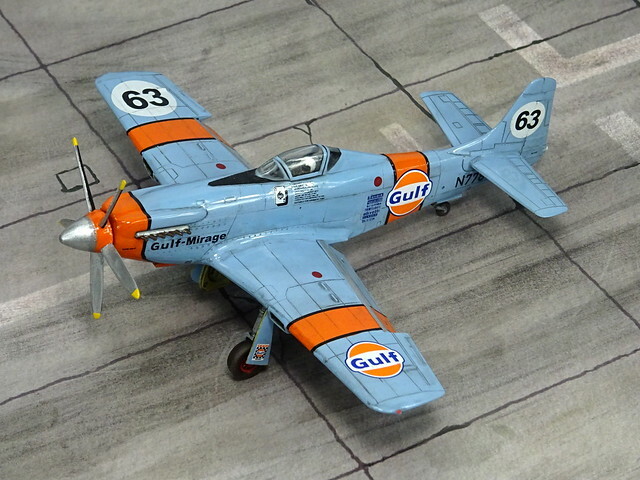 Outwardly, the new sponsorship resulted in a new name - the aircraft was now called "Gulf-Mirage" - a new, very different livery in the typical Gulf Racing colors: light blue with bright orange trim. 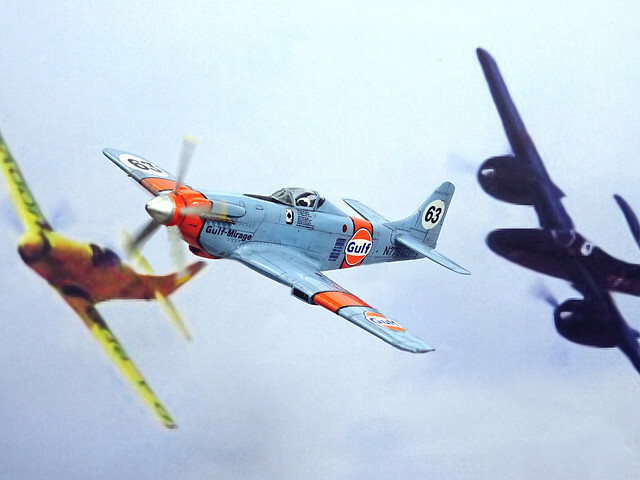 With Peter Holm, a new pilot was found, too. 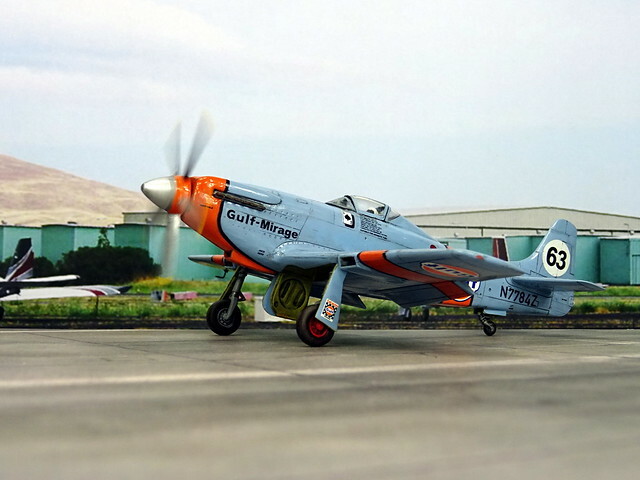 1973 saw the first start of the refurbished aircraft with the new starting number 63, but "Gulf-Mirage" did not finish its first race due to oil pressure problems, and any further flights were cancelled. 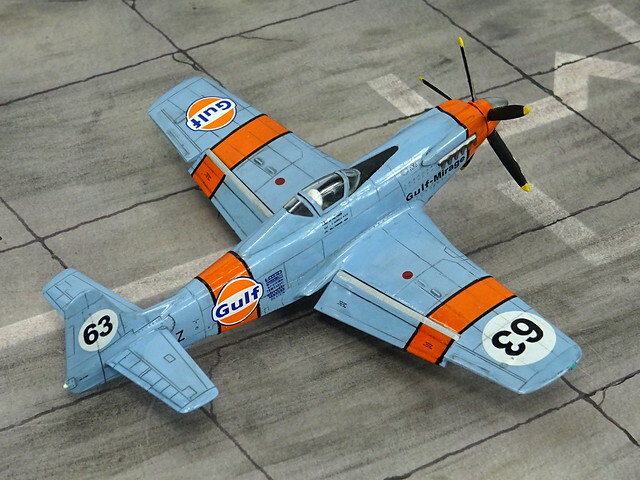 In 1974 the pale blue Mustang was back - and this time everything worked fine and "Gulf-Mirage" was able to score a 3rd place in the Unlimited Class Gold Race. 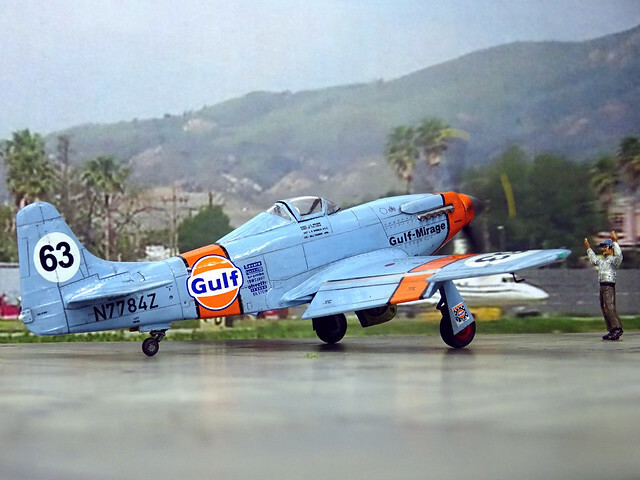 In 1975 the aircraft raced at the California National Air Races and finished in 2nd place - with a speed of 422 miles per hour (679 km/h). 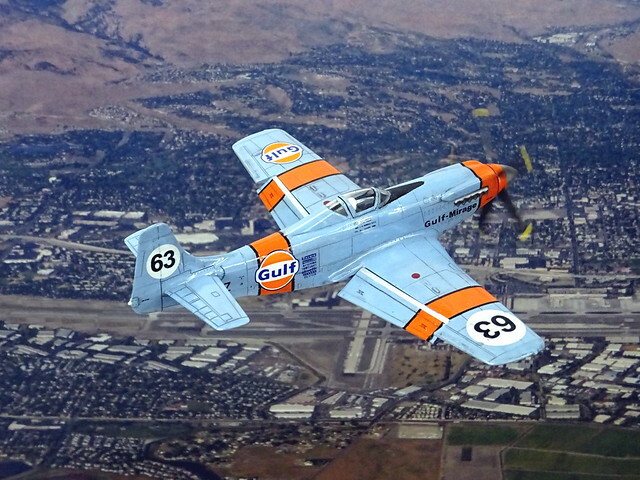 After racing for several years with limited success, the aircraft was sold in 1983 to Wiley Sanders of Sanders Truck Lines, and it lost its characteristic blue and orange livery. 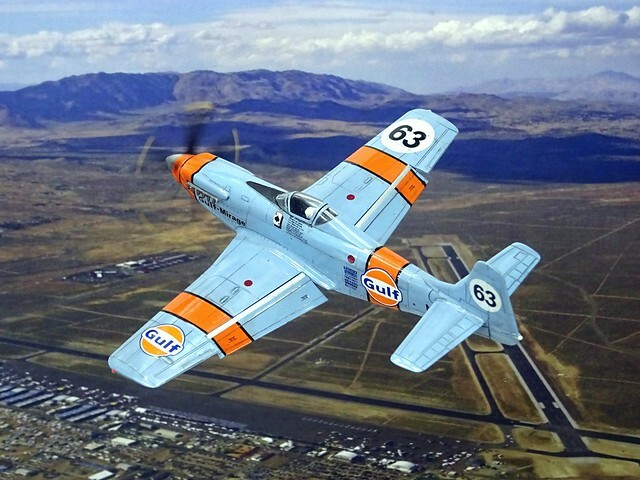 After frequent participations in various air races, the aircraft was sold again in late 1989 and moved to the United Kingdom, not to return to the United States again until 1995. Since then, the aircraft has not made any public appearance yet. 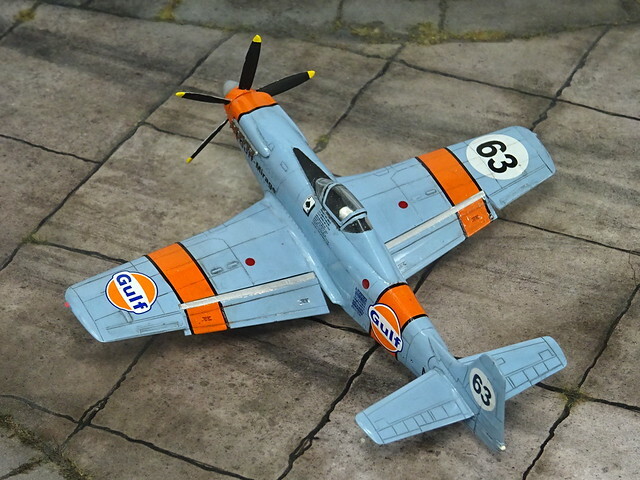 Well, the “Gulf-Mirage” looks simple and plausible, but in the end a lot of modifications were integrated that shift the Reno Racer away from the standard warbird. I am actually quite pleased with the outcome, because neither the technical modifications, nor the fictional/adapted Gulf Racing livery look out of place. The combo works well! Great! This looks like a winner! A cracking job there Thomas. I especially like the wing mounted radiators. Am I the only one seeing a hint of CAC-15? Must be the smaller canopy, I think. Makes the aircraft look a bit bigger than a standard Mustang. 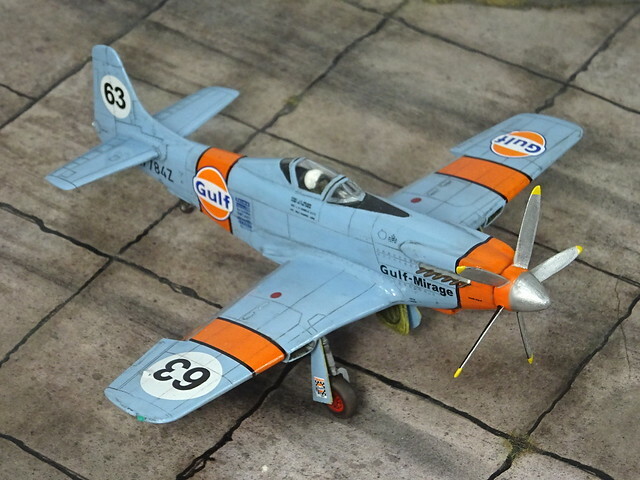 IIRC when the article in an old Airfix (or Mil Mod) Annual came out, the converter used the sliding section of the kit canopy cut down and mounted backwards... maybe for your next one? Beautiful! I love how you implemented the various mods, especially the relocated radiators. And the canopy is perfect! Looks just like Dago, Strega and Voodoo. Bravo! And I quite like some of the race photos, too! Very clever work!